upiter is a happy soul, always wagging his tail when he sees you. Jupiter was found in the streets as a stray. He has a stiffened back right leg (most likely to a past break that didn’t set properly), but this does not stop this little guy. He may have a funny walk, likened to a skip, but you wouldn’t know it when he runs – and he LOVES to run! When he sees the other dogs in the park, all he wants to do is play with them ( a little rough-house as he is very strong, but this guy is only a year old still), and that includes his people friends too. Jupiter loves to be around people and other dogs. He loves going for walks, but will want to lead the way (he can pull quite hard) and chase squirrels, birds, even moths. He will need continued leash training, but should pick up quickly as he is a smart boy. He would most likely love regular visits to the dog park to make new friends. When you get down to his level, he often goes into play mode, so be ready for a lot of rustling. He is quiet at night and is happy to sleep in on a snuggly dog bed. 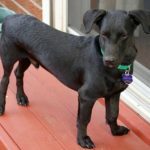 If you want a dog with a fun personality, some stubbornness, and moderate to high activity level, then Jupiter will be happy to be your furever friend.